Bruegger’s has two fun freebie deals. Go to Bruegger’s Facebook and click on the Iced Coffee Coupon for a Free 16 oz iced coffee printable coupon redeemable on 6/21! You must use the coupon prior to 4 pm. 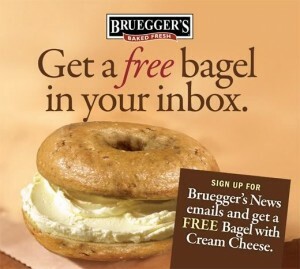 Bruegger’s also is offering a Free bagel with cream cheese when you sign up for their email newsletter. The coupon will appear in your inbox after you sign up.